Tucked away in a quiet corner of the old city of Hyderabad is the Sitaram Bagh Temple. Built by a banker Mr. Puranmal Ganeriwal in 1832, this centuries old Shri Sitaram Mandir is a sprawling complex of temples and beautiful airy courtyards spread over twenty five acres. From the main entrance and its imposing facade to the labyrinth of quadrangle courtyards leading you on to endless discoveries, this peaceful temple is a visual treat. Built in a style that is exquisitely distinctive, it combines the North and South Indian styles of architecture with the European. Back in the day, Seth Puranmal acquired land in what was then the village of Mallapally, in the outskirts of Hyderabad, laid out an expansive garden (bagh) and built a temple for Sitaramji. Thus bestowing on this temple, the moniker Sitaram Bagh. This stretch of land was also the site for a Qutb Shahi Mosque, which stands till today, albeit separated from the temple by a concrete wall. Also on this expanse is an archaic step well that was connected via subterranean ducts to a well in the mosque. It is around this step well that the various structures of the temple complex, including a gaushala, ved pathshala and houses for the Bramhin families were constructed. This entire compound is now a protected monument by the Archaeological Survey of India. 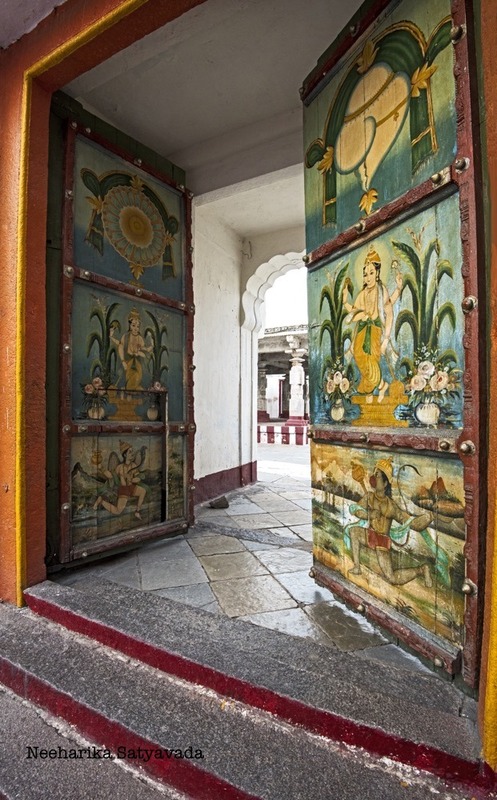 As you enter the main temple, intricately painted doors, imposing archways and massive colour blocked doors take you through a series of courtyards. Each one opening out to a mandapa, a temple or to just an open-to-sky pavilion enclosed in European style terraces adorned with Rajasthani style jharokas. If one courtyard boasts of a South Indian mandapa adorned with the Dasavataras carved in stone, the very next one will surprise you with a mandapa of European columns and fading frescos. Even the two main temples alternate in their styles. While the Sitaramji Mandir is built in the North Indian style, with an entrance reminiscent of a palace in Rajasthan, the Varadarajaji Mandir is built in the typical Dravidian architecture style of South India. The idols of the main deities are in marble, staying true to the prevailing theme of Rajasthani. Little surprise then that the Sitarambagh temple is popular with the local Marwaris in and around the old city. The Hanuman Mandir though, sitting away from the maze of the courtyards and almost too close to the boundary wall of the complex is a little cut off from both the main temple and its old world charm. It wasn’t until renovations began around 2015, that people even knew just how old or huge the stone idol of Hanumanji was. Only once the twelve inch sindhoor chola on the sculpture was taken off did they realise that the Hanuman idol was in fact burrowed knee deep in earth. The eight feet by five feet statue was then dug out and reinstated, complete with a new South Indian style Gopuram. What is distinctive about this addition though is that, facing the four directions are Abhay Hanuman, Veer Hanuman, Bhakt Hanuman and the Das Mudra. All of them typically North Indian on a South Indian style shikhar. Every turn that you take in this grand layout, will only reinforce in you the awe that you experience at how beautifully North meets South in this temple. Remember: Dress conservatively. For though not really crowded like the other temples in the city, the management including even the security of the temple complex are quite orthodox in their ways. They double check to ascertain that you are indeed a Hindu before you are even allowed to wander into the outer courtyard of the temple! Don’t Miss: The baoli (step-well). It is outside the main Sitaram Mandir and fenced off, making it in a way, quite easy to miss unless you go looking for it. Go straight along the path to the Hanuman temple, right across from the main entrance and you will find it to your left. PS: The famous Purana Rangji Mandir in Pushkar was also built by the same Mr. Generiwal in the year 1844. Yet again, in the same unique combination of the South Indian Dravidian style and the North Indian Rajasthani Vaastukala. Reminds me of Rajasthan temples. Great pictures. Nice info!!! Was not aware of this place and I can easily relate it to the temples in Jaipur and Pushkar. Lovely images. Do justice to the place!